As far as perception of the war in Iraq goes, it’s worth remembering that perceptions are changeable. As the war began in 2003, the New York Times required less than three weeks before it ran a front-page report by a star correspondent of the last generation, R.W. Apple, which hauled out the heavy word of the Vietnam generation, quagmire-as in the quagmire in which, Apple wrote, U.S. troops were already bogged down. Three weeks later, those same quagmired troops had sped into Baghdad, watching as jubilant crowds pulled down the great statue of Saddam Hussein in the center of the city and organizing a systematic search for the suddenly deposed butcher of Mesopotamia. The statue of Saddam, of course, was in fact pulled down by a U.S. military vehicle. 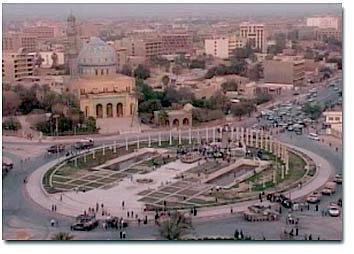 There were no "jubilant crowds" at Firdos Square that day - only Western journalists and a handful of militiamen linked to the conman Ahmed Chalabi. With regard to Apple, Novak appears to be manufacturing a quotation. Novak doesn't cite a source, and my searches haven't turned up any article in which Apple uses the word "quagmire" in reference to the Iraq war, though he did use the term in a 2001 piece about the war in Afghanistan - where, it should be noted, Osama bin Laden remains at large and the Taleban are resurgent five and a half years after the invasion. In an article he'd probably like to forget, Slate columnist Jack Shafer mocked Apple for implying that the Iraq war would turn into a quagmire, but nowhere does the Times reporter appear to have used the word. But the streets and alleys of Iraqi cities are ideal places for urban guerrillas who can blend into the crowds to operate, just as those of Belfast and Tel Aviv have done. Not only are the guerrillas hard to root out, but doing so also works against the American desire to be seen as agents of liberation, not agents of conquest. Who is a fedayeen fighter and who is a civilian? Marines tell stories of Iraqis changing in and out of uniform. A civilian bus turns out to be a troop transport. Guerrillas cluster near schools and hospitals. In several cases, troops carrying white flags have opened fire. Iraqis do not play by the rules of West Point and Sandhurst. Although the American stay is likely to be shorter [than the British colonial occupation], it could generate the same kind of resentment if not handled with a deftness rare in the annals of triumphant armies. That, in turn, could fuel the kind of resistance to a new government that the United States wishes to minimize, even if Mr. Hussein is killed or captured. It could also further destabilize the Middle East as a whole -- precisely the opposite of what Washington has set out to achieve. Novak's point is to counter Bottum's claim that "the war is already lost" on account of the way it is perceived. "Perceptions are changeable," Novak argues - and he proves his own point by inverting the correct perception of the war. Ronald Reagan taught us that the perceptions promoted by the liberal media do not, in fact, control the way Americans think. As Clare Boothe Luce once explained, from his experience as a B-movie actor Reagan learned the difference between the box office and the critics. If you win over the first, you can be awfully sweet-tempered to the second. He showed that the hostility of all the liberal media could not, finally, drown out common-sense reality. This analysis begs the question of who represents the box office, and who are the critics. An enthusiastic propaganda campaign might theoretically convince the American public that all is well in Iraq, but will it convince the Iraqis who suffer the effects of the war, or the soldiers who have to fight it? I agree with Bottum that in the view of the media the war has been lost. But we may also expect this perception to reverse itself if events in the coming six months unmistakably change direction. Novak asks us to consider what would happen if things really did improve in Iraq: if the Mahdi army were to relent, if al-Qaeda were to flee Baghdad, and if the Sunnis were to see the light and turn against their own insurgent faction. "With these conditions met," writes Novak, "Iraq would come to seem reasonably tranquil." And this may be true, but it's an argument that concedes the weakness of the conservative forces of perception in the face of stiff resistance from reality. Novak seems unable to resolve his own confusion on this point. On the one hand, he contends that Bush "should have seen, in warfare, the crucial importance of one key goal: victory" (but does this mean that Bush was not seeking "victory" to begin with?). On the other, he acknowledges that "victory" can only be achieved "by bringing security to the people." Again, the conservative impulse to demand a perception of victory runs up against reality's brick wall. A long-established lesson is that, even in the best of times, government is mightily incompetent—and the bigger government gets, the more incompetent it becomes. Think of how much time it takes to obtain a building permit, to go through vehicle registration, to correct a government mistake on tax forms or on public utility bills, etc. Recall how few government offices in the same building communicate with the others, and how often you are shuttled back and forth. Conservatives have long tried to use the fact that the Post Office lost your postcard to discredit the concept of social insurance and activist government generally, but with the movement's need to escape from under the looming catastrophe of the Bush administration, this argument has gained new urgency. Expectations for Bush were too high, Novak tells us, as though no president had ever governed competently at all. At any rate, suggests Novak, the tide may be about to turn. He spends the next several paragraphs praising Bush's latest State of the Union address, for its "plain-spoken rhetorical style," its efforts "to occupy what some think of as Democrat [sic] territory," its "simplicity and power" in addressing, once again, the threat of jihad (on this last point Novak asserts that the "stated aim" of the nebulous "Jihadists" is "forcibly to convert us to Islam or to exterminate us until the caliphate stretches around the world" - reason once again to doubt that conservative ideologues in fact understand anything at all about the terrorist threat outside of their own self-aggrandizing fantasies). Novak even cites the post-speech back-slapping as evidence that the address did wonders for the president's popularity. Often enough, the nation’s public leaders have been burned in effigy on the spots where their gleaming statues are later paid respect. If the reputation of President Bush meets such a fate, his 2007 State of the Union address just might be seen as one of the modest pivots on which that turn began slowly to revolve. There's a lot of speculation packed into that "if." Despite the post-address polls Novak cites as evidence of the public's great positive reaction to the State of the Union speech, the latest polls show Bush's approval rating lower than it's ever been. At the very least, in the face of passionate hostility at home and abroad, George Bush has proved himself a brave and determined man who has staked his presidency on getting democratic momentum underway in the Middle East. What is remarkable here is how, for the president's supporters, the notion of victory in the war of perception mirrors their notion of victory in Iraq: you can't prove that it will never be won - only that it hasn't been won yet. The debate between Bottum and Novak matters because it will be difficult for conservatives simultaneously to disassociate themselves from the Bush legacy and to argue that that legacy will ultimately prove a positive one. But if you appreciate the irony of fate, you can't help but marvel at how, for Bush and for the conservatives, the struggle against historical judgment looks so similar to their struggle against reality, in the war upon which they have staked so much.